Hello! As promised today I’m featuring a tour of the studio above our two car garage. We added this space seven years ago, it has a kitchen, bathroom, laundry room, and walk in closet all contained within 600 square feet. It’s been rented to tenants in the past, used for storage, used for styling my fabrics, and for hosting Matt’s poker night. My stepdaughter lived here for 1½ years after college, but now she’s moved to San Francisco. We envision renting it out again someday as an AirB&B after we create private access with a new staircase. Until then, it’s used as a library to store many of my books and collected objects, I like to escape here to read a few times a week. It’s also a space for friends and family to stay when they visit. I redecorated it over the last month, bringing up furnishings and accents that used to live elsewhere in our house but have since been replaced (the rug, club chairs, etc.) I also bought a few new things to make it stylish and cozy (the coffee table, pillows, linens). You’ll recall several years ago we added the Billys to built in bookshelves, such a smart move for storage on a blank wall! I have plans to add shelves above to take the bookcases up to the ceiling and also install lights (I love the look of Nate’s bookcases) but that will have to wait until next year. I recently painted the backs with Glidden’s Alligator Pear, replacing the deep teal blue with warmer olive green. The entire space has an analogous color medley of navy and olive. On the opposite side is the bedroom where I have two mismatched nightstands, the white paint and ring pulls tie them together. That dresser used to be navy blue, I painted it white again and the rings and fretwork gold. I was forced to hack the bottom four inches of the legs off when I realized the smaller chest on the right I had ordered was shorter (desperate times call for desperate measures) but at least the lamps sit at the same height now – it was bugging me when they weren’t. The genie lamps are Nicole Miller from HomeGoods I love that the indigo finish is matte not gloss. The little glass knot is from Target, the Greek key trim is from M&J Trimmings, one of my favorite ways to embellish plain linen window panels. The triptych of art prints I found on Etsy, I framed them with inexpensive frames found at Michaels that I spray painted gold. The green pillows any navy quilt are both from Target, the watercolor floral fabric called ‘Blue Floral Splat’ at Joann’s and sewed a lumbar pillow cover with it. The entrance to the kitchen is just off the living room. Years ago I painted the kitchen cabinets white, it still looks the same, view the kitchen here. And there’s that $10 cabinet that is still one of my most popular thrift store makeovers. I have a wood pedestal table and pair of chairs in here too, there’s a peek of one below. You can see them together here. With a controlled color palette you can mix patterns and styles with abandon, both traditional and contemporary. The patterned window panels are from West Elm, the loveseat is IKEA Ektorp, I recently bought the gray cover to use instead of the white. Pillows on the club chairs are also from West Elm, the pillows on the loveseat are from Pier One. The rug I bought at Overstock last year. Between the loveseat and the French doors there was room for a desk, since our oldest couldn’t fit her desk and chair in her tiny San Francisco apartment she left it here and it works perfectly in this space! This is a nice little spot to pull out a laptop. The mirror used to hang in our living room above the mantel, I’ve since replaced it so I moved it up here. I love the chain link frame. The lamp is from Target. I’ll add more links to the products seen (if available) to the Shop page later today. If you have questions about something in particular, just ask. Until then, hope you enjoyed the studio tour! I looked through the post again but still didn’t see (sorry if you link it!) – where are the club chairs from? I love them! :-) Beautiful work, as usual. I think I want to hire you. Lisa, I bought those club chairs on Joss & Main about three years ago, they were in my master, then moved down to the living room, now they’re up in the studio since I have a pair of wingbacks in the living room. I sometimes see them pop up on Joss & Main from time to time, they’re a classic look! Love this space! Where did you find the pendants? Oval drum pendants found at Lowes, about two years ago, not sure if they carry them still but the pair is perfect for this space! So pretty, Kate! And so you!!! Was this the same studio space that was coral with a grey credenza at one point??? I always wondered what happened to that space, the reveal was so worth the wait! Wow! I am Seriously in love with this space. We live in San Francisco and now I’m thinking how lovely a spring stay in your AirB&B would be. So beautiful! I’d love to move right in!!! :) The color scheme is so perfect and earthy but the navy bumps it up a notch in sophistication. Wow what a beautiful space. It had such a refreshing vibe. Another beautiful space of yours, Kate! I LOVE it! Very pretty! I would be absolutely thrilled if Ibooked an Air BnB and ended up here! Love this! Where did you get the desk chair? I didn’t see a mention of the paint color on the walls. I would love to know the bright but not white color name; it pairs beautifully with the Alligator Pear. We are very seriously considering downsizing again to an even smaller home. You have just shown me how beautiful and functional a small place can be. All we need! 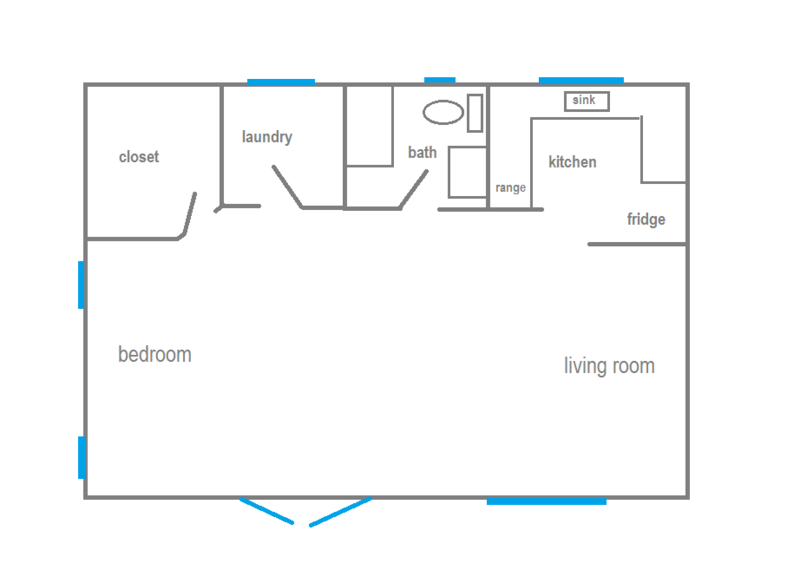 Do you have a floorplan available for that space? Gorgeous work! Love the color combination!!! Can you tell us about the flooring? Is it concrete slab or tile under those beautiful rugs? A fresh, lovely, inviting space. Really like the APear paint. As mentioned above, it’s more pulled together than my home. Having recently lost my husband, one huge thing I want to do is freshen and update my home…it’s filled with many years of memories and I think change would be good. Lots to do. Wish I could find someone with your flair and eye for a bargain to help me in Houston! Also…what mattress did you mention using at your brother’s home a few posts ago?? Thanks for all the inspiration! Wow! Looks like the perfect place to stay one day. A private entrance is a great idea. Love the feather art work of course! Ha Andy you spied your work! I can’t believe it’s only 600 square feet, u did an amazing job! Off topic, but: I like the layout, pretty colors and such. But that rotating banner on the top makes me pause when I come to your site because I think “oh, nothing new today” when it’s the same post I’ve seen before. I just realized I have to scroll down because it’s a rotating header. Don’t love it. But love everything else. I love all the book on the exposed shelves. Where do you find them? Or have you been collecting them? Also, where do you find flat eucalyptus? I noticed some in a few pictures. Yet another beautiful space, Kate. I love that even the stacks of books are color coordinated! Where is the coffee table from? Love this space. It is just beautiful Kate! Lucky friends and relatives who get to stay there! The color scheme is lovely and every detail throughout is just perfect. You do top notch work! Very classy. Wow what a lovely space!! One of my favourite color scheme’s right now it blue and white. So bold yet calming and full of character. Love the pops of green to. That desk is beautiful, the whole space screams comfort, bright, airy, come on in and enjoy. Thanks for sharing, great tour! Where is the bed frame from? The space looks really lovely. I love it, also love the new blog update!! What a great spot and love the furnishings! How can I find that rug? I bought it at Overstocks Karen.